To obtain the salt, very shallow basins about 6 inches (15 cm) deep are flooded with sea water, then the water is allowed to evaporate. As the water evaporates, salt crystals form on the surface. The slightest movement of the water — say, by a breeze or a bird — causes the salt to sink. The salt that sinks is called “Sel Gris” — sea salt that has a grey colour from the material at the bottom of these shallow pools. On a still day, however, the salt crystals will stay on the surface of the water for skimming off. This salt is called “Fleur de Sel”, meaning “salt flower”, because as it crystallizes on the surface it forms patterns that look like flowers (more like snowflakes, actually.) It stays white, as it didn’t touch the bottom of the pool, and it is considered the least salty part of the salt in the water. 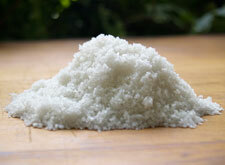 Out of 80 pounds (36 kg) of “sel gris”, only 1 to 3 pounds (450g to 1.3kg) of “Fleur de Sel” can be skimmed. The production scene is quite charming, with its age-old production methods, the scent of the ocean, and the sea-birds circling overhead, looking in the flats for trapped sea-life that will make an easy target for dinner. Fleur de Sel is very expensive. It costs about 100 times as much as table salt. (The “Sel Gris” is somewhat less expensive.) With a price like that, foodies naturally rave about Fleur de Sel: its aroma (some say it has the faint aroma of violets), its taste and the benefit of its trace elements. Given all the birds, you might indeed well wonder just where all those vaunted trace elements are coming from, though you may never have associated the smell with violets. 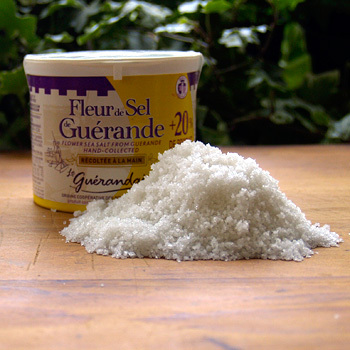 Fleur de Sel should be used as a “finishing salt”, that is, as something that is sprinkled on food at the very end of cooking or just before presentation. Allowing sea water to evaporate in flats, leaving the salt behind, is a technique the Romans learned from either the Gauls, the Egyptians, or both. Many places flogging “Fleur de Sel” take pains to point out that Pliny the Elder mentions “Fleur de Sel”. And it’s true, he does. He calls it “flos salis” in his Natural History, Book 31, 85-90, and again a few paras further on. The “flos salis” he describes, though, is moist and has a bad smell. The Romans didn’t eat this salt; they used it as a purgative and ointment.